The Soviet Project 705 (NATO Codename Alfa) submarine was unique for several reasons. It was designed to use a lead-cooled fast reactor, which utilized molten lead as the primary coolant. This made the power plant much smaller, which allowed for a smaller hull design. The negative side of that, though, was that the reactor had a much shorter lifespan. Another innovation of the 705 was the hull, which was constructed from titanium alloy and featured variable diameters. The result was a hull capable of reaching extreme depths, although other equipment could be damaged at those depths. Some of the Alfa submarines were tested to depths up to 1300 meters, and the submarine routinely operated at 1000m depths. 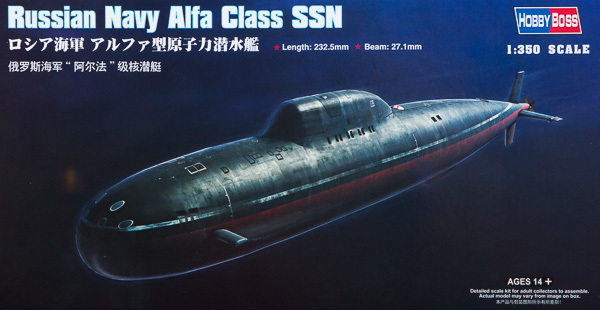 There has been a big push for new tool submarine kits as of late, and Hobby Boss has jumped in with some great subjects, one of which is this kit, the Alfa SSN. 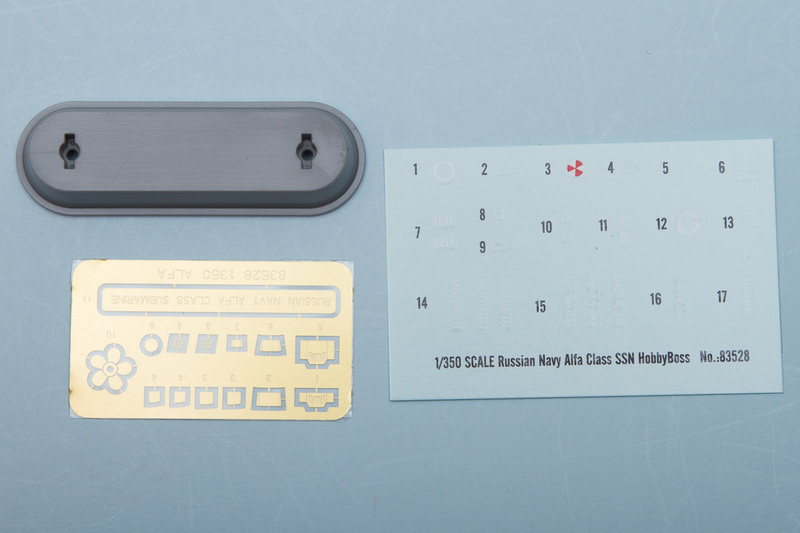 Molded in light gray plastic, this kit features some excellent surface detailing, included photoetch parts, and a small decal sheet that provides the basic markings found on modern submarines. Jumping into the building of the kit, this is pretty straightforward. The hull is split into upper and lower pieces, with the upper half including the sail and the horizontal fins. The latter incorporate the small propellers that were used for slow speed maneuvering. Unfortunately, the propellers are molded in place and resemble little more than pegs. These are pretty small two-bladed propellers, though, so with some careful filing one could probably rework those into passable examples. Still, it would have been nice to see those on the photoetch fret. Once the hull halves are glued together, the rest of the assembly is putting all the fine details in place. These are split between plastic and photoetch parts. For the plastic side, there are two scoops for the underside of the hull. Again, a great opportunity for photoetch is the grates that are found on the front of these, but the kit missed those for some reason. The vertical fins are separate, as are all the rudders and elevators. The forward dive planes are separate, and you get a full complement of periscopes and antennae for the sail. Finally, a solid plastic screw rounds out the injection parts. The photoetch details offer some extra details and an option for replacing a plastic part. 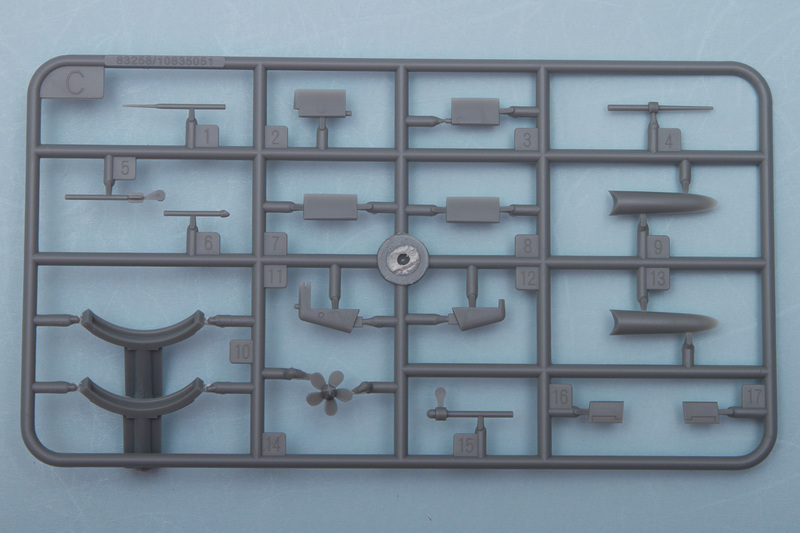 For those wanting a more detailed screw, there is a photoetch blade set that replaces the plastic ones. The rest of the photoetch details involve the sail. There are photoetch vents for the sides, and a photoetch windscreen, albeit with solid windows. The rest of the photoetch covers the various antenna hatches. There's optional pieces provided for you to have the various hatches open or closed. By mixing and matching the various antennae, you can have a unique arrangement for your Alfa submarine. The decals included are very simple and consist of the depth markers on the bow, fin, mid-hull, and aft hull. There is also a hull number (691), although it was rare to see these on operational submarines. Finally, there are decals for the hatch surrounds and various outlines. The color diagram provides clear locations for all the decals, as well as accurate painting notes, including the white demarcation line along the length of the hull. While there are some minor issues with this kit, overall it is pretty good and does a nice job of capturing the lines of the Project 705 submarine. It is a simple kit to build and will make for a nice diversion from a more in-depth model. My thanks to Squadron for the review sample.